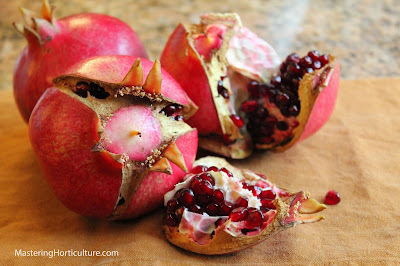 Why do pomegranates crack or split? 1. Sudden increase of available moisture at maturity. 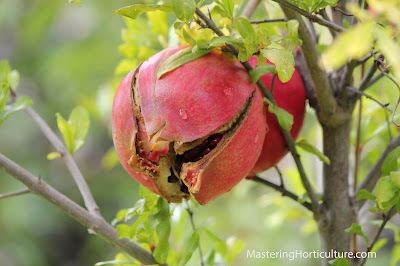 When the fruits are mature and a sudden increase of available soil moisture occurs, as in the case of rain, some of the fruits responds by splitting. 2. Inconsistent watering. Sometimes fruits split when watering is inconsistent. When the plants undergo incipient wilting prior to watering, the fruits tend to split. This phenomenon can also be observed in other crops like tomatoes during the summer after a spell of hot weather and plants are given more water to compensate for the wilting. 3. Some varieties are more susceptible to splitting than some. Although I would say that genetic attributes of a plant fail to deliver when cultural management are not up to par. This pomegranate in the picture is 'Wonderful', known to be resistant to cracking. But because it is growing in a container, the soil is often on the side of dry. While the tree can survive on less water, the sudden rise in available water triggers extreme physiological changes defying that which genetics was meant to accomplish. Beautiful guttation! I was inspecting my broccoli plants for bugs when I saw this beautiful beads dangling on the edges of the leaves. They are just a reminder that we had a good amount of precipitation during the last couple of days. And because this is California, we get some really nice sunny weather afterwards providing the conditions for guttation to occur. For more information about this phenomenon, read my earlier post on Guttation. Stroll in your garden regularly. There is always something to discover there. My battle with pests continues. 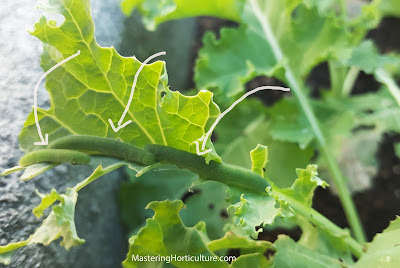 When I thought the cabbage worms on the kale have been eradicated, I found another colony of insurgents on the underside of the Napa cabbage leaves -- Aphids! What looked like soil particles are pests sucking the life out of my plants. Aphids are very tiny insects but they are not to be taken for granted because of their ability multiply at an alarming rate. Aphids are parthenogenetic. They have the ability to reproduce asexually. They can reproduce without mating - giving birth to multiple live offspring in a day (1). Not all of theme have wings but they have some allies - the ants - that can move them from one place to another better place. So what do you do when you find out that your young plants are infested with aphids? When it comes to my kitchen garden I resist the temptation to spray anything store-bought for as long as possible. In other words, pesticides are my last recourse. At the first sign of infestation, aphid colonies can be easily disrupted by spraying them off with water. Repeat daily until they are gone maybe about three to four days depending on how severe the infestation. If you think they are beyond water-treatment, I would use Neem Oil or other plant-based pesticides. 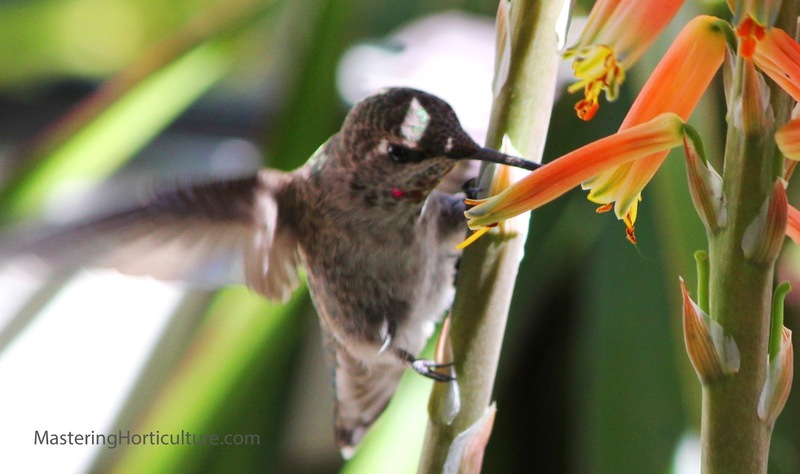 In addition to this, there are also beneficial insects that are naturally around your garden such as ladybugs (Coccinella septempunctata) and lacewings (Chrysoperla rufilabris). To increase their population in your garden you can buy them from your local nursery and let them out where the problem is most severe. After all the secret is not in the toxicity level of the pesticide but the conscientiousness of the gardener in regularly inspecting the garden. When the problem is caught early, it is manageable. The day is mild and almost cool. Most leaves are grayish green from the accumulation of dust. 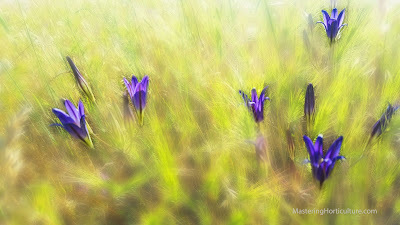 For some plants new leaves are emerging, flowers are blooming again and the grass is once more putting on a sharper tint of green - as if they did not get the memo. This is October in California! 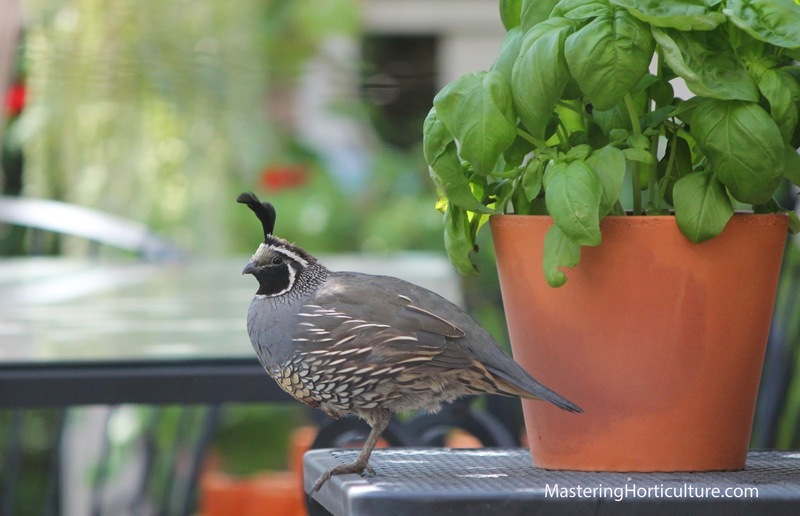 Quail and Basil sitting on a patio table. 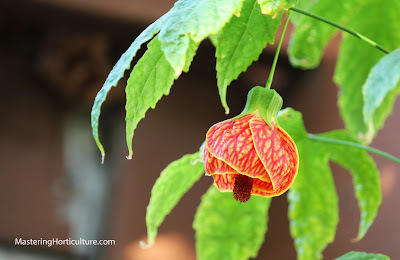 Abutilon 'Tiger Eye' is beginning to bloom again. Kalanchoe luciae ''Flapjack' seems to appreciate cooler temperatures. 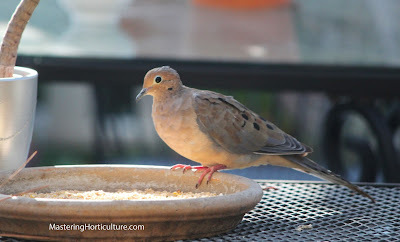 We attract birds into our garden - they are interesting and are effective pest control. Hydrangea: Regardless of the color, the flowers usually turn burgundy in the fall. October is the second spring of the year! Cabbage Worm (Pieris rapae) on kale. The leaves of my kale and broccoli are disappearing. I thought that they were being eaten by some earwigs but upon close inspection I saw a multitude of velvety green larvae that are camouflaged on the leaves. These are the larvae of the adult moth Pieris rapae. Pieris rapae is a beautiful small-sized butterfly known as the Cabbage White butterfly. If you see a dainty-looking white butterfly with black dots on the wings flying around your garden, be extra observant. While the adult is harmless, the larvae (commonly known as Cabbage-worm) are voracious and they feed on most brassica crops. At the early stages of the larvae, the damage happens slowly but once they reach a substantial size, they can defoliate the plants quickly. There are a number of effective and safe biological control for the cabbage worm. Basillus thuringiensis (Bt) and spinosad. Ask your local nursery for these active ingredients and they will lead you to the right products. These are both biological and considered organic pesticides. As for me, since I do not have a huge garden, I prefer to do it by hand - picking the worms every morning. This is also biological and organic method, mind you. :) But this requires that I have to be vigilant. First day of fall. The temperature dropped about ten degrees (F) since yesterday and a few drops - literally few drops - of rain fell on the ground. But in this part of California, any amount of precipitation is appreciated. 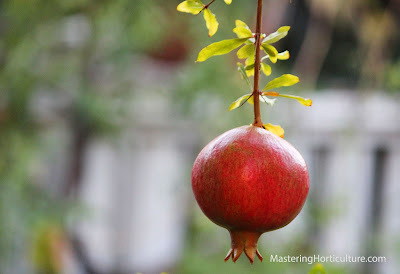 And what better picture to mark the beginning of the season than the pomegranate fruits that are getting plump and turning red. Although there are other fruits such as figs, apples and even pears that are too high even with my fruit picker still remaining, they all are all winding up. 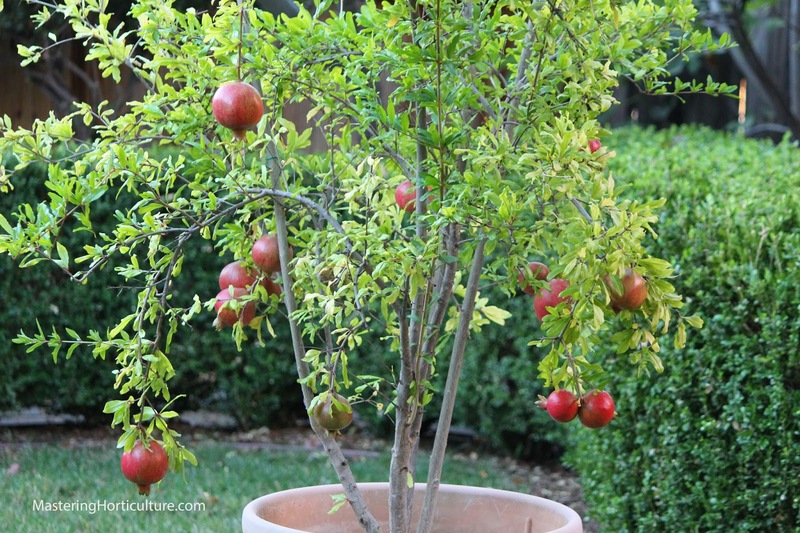 Pomegranate tree in a pot. Stilted on long skinny stalks, they dance to the slightest wind. As they join in the dance. 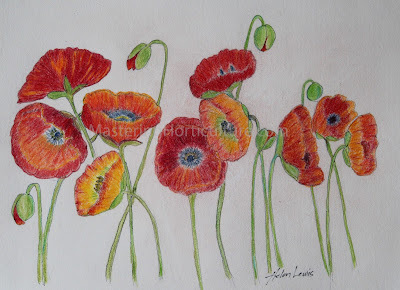 Happy are the fields where poppies dance. 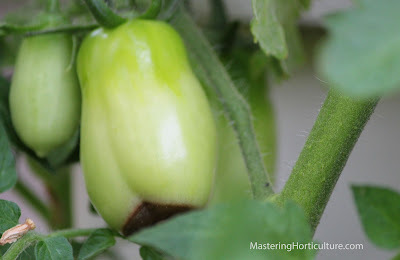 One obvious observation in my garden this season is the susceptibility of 'San Marzano' tomato to blossom-end-rot. All the fruits harvested so far have the distinguishing ugly black spot on the far end. 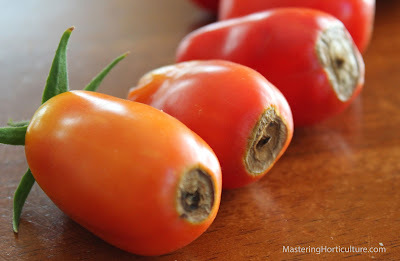 Blossom-end-rot is caused by lack of available soil moisture. It is a common knowledge that blossom end-rot is a calcium deficiency symptom. But I say that in this area (Zone 9), it is more of water stress damage. I have noticed that symptoms always show up few days after plants experienced water stress. The obvious indicators of water stress is wilting. Such wilting is often unavoidable during periods of hot days, as in 100-108 (F) days that we had last week, when the rate of transpiration is greater than the rate of water uptake. As the temperatures soar above a certain level, C3 plants like tomatoes will automatically close their stomata to avoid further water loss. This phenomenon halts transpiration which also halts water absorption by the roots. 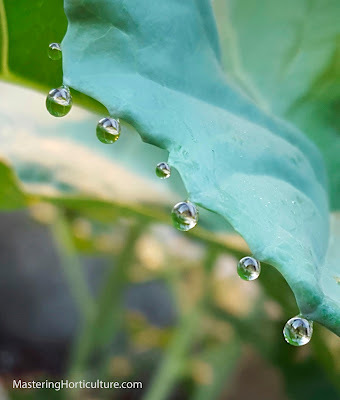 Imagine a micro-siphon that starts from the tips of the roots and ending at the stomata on the leave surface - that is the xylem that carries water and nutrients (including calcium) to the different parts of the plant. Nutrient-carrying water passes through this siphon constantly except when there is no water available within the root zone that result in the closing of the outlet (stomata). In other words, when the plant is wilted, the passage of water has been closed. No matter how much calcium is in the soil, when water is not running through the xylem, calcium will be limited in the plant. Calcium is needed in the formation of cell membranes. 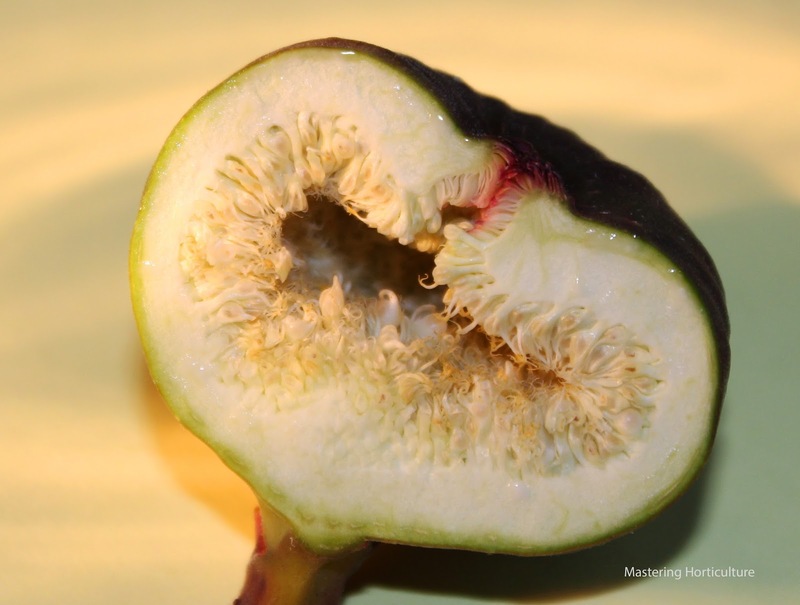 When the plant is deficient in calcium, the membranes on the furthest end of the fruits break down. Hence, the blackened spot. 1. Mulch. Not just mulch but thick mulch and compost around the base of the plants. Refresh mulch in June as the temperature begins to get really hot. 2. Automatically irrigate. One day of skipped watering during hot days will cause damage on the fruits. Increase irrigation time during the month of June all the way to July. 3. Apply fertilizer only in low doses. The salts in fertilizers compete with the plants for water. 4. Choose an area that gets morning sun and afternoon shade for tomatoes. When choosing tomato varieties, consider their resistance to blossom-end-rot. Have you ever wondered why some strawberries bear fruits earlier than others? Have you ever wondered why some strawberries bear fruits longer than other ones? 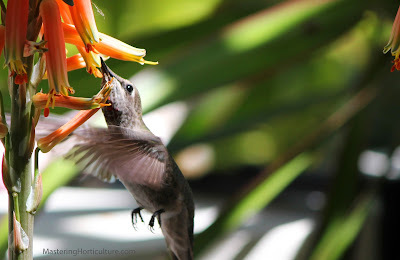 Or for that matter, have you ever wondered why some plants flower only at specific times of the year? 1. Photoperiod or Daylength is the number of hours of daylight during a 24-hr period. 2. Flower Initiation - is the beginning of reproductive phase in plants which is triggered by biochemical and hormonal changes in the plant. For us gardeners, we would see this phenomenon later when visual indicators are met - flowers are out. 3. 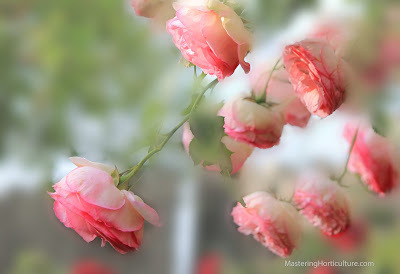 Remotancy is the ability of a plant to bloom repeatedly throughout the growing season. This is an important characteristics for flowering well as fruiting perennials because it prolongs the productivity of the plants. Short-day (SD) plants are those that bloom only when the daylength is less than twelve hours. Long-day (LD) plants are those that bloom only when the daylength is more than twelve hours. Day-Neutral (DN) plants are those that can bloom regardless of the daylength. Strawberry is one example of a plant that is responsive to photoperiod. which plays a significant role in its flower initiation as well as remotancy. Strawberry varieties are classified according to their flowering response to this factor. June-bearing varieties - SD strawberries. These are recommended for canning purposes because they yield a heavy crop in the summer. They are the varieties that are generally grown commercially. June-bearing varieties bloom in spring when the days the less than 12 hours and warm enough for plants to grow at a reasonable rate. In the fall when the days get below 12 hours of daylight, they undergo flower initiation again. Ever-bearing varieties are LD strawberries. These varieties start to bloom late in April when the daylength exceeds 12 hours and all the way to autumn when daylength shortens to under 12 hours again. Ever-bearing strawberries are recommended for a kitchen garden where fresh strawberries every now and then is desired. Day-Neutral strawberries are those that are not significantly affected by photoperiod. They bloom regardless of the photoperiod as long as other factors are favorable for growth. Can we then say that strawberries will always bear fruit when the right photoperiod is achieved? The answer is no. The story is not that simple. The effect photoperiod on flowering assumes optimum temperatures. After flower initiation occurs, temperature comes in and plays a significant role in the development of the flowers into a fruit. 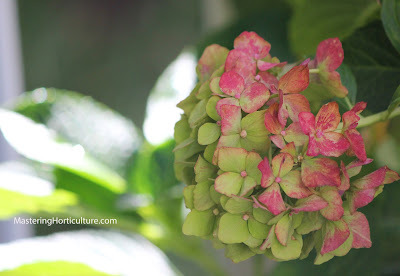 In our area (Zone 9), June-bearing varieties, can start to show flowers as early as February but such flowers fail to develop into fruits because the temperatures are too cold for fruiting. Similarly in the fall flowering is triggered again by the shorter photoperiod but such flowers fail to develop due to low temperatures. 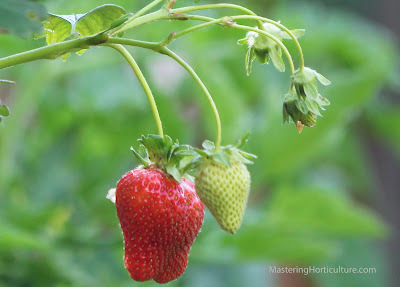 The reason for the characteristic heavy crop from June-bearing strawberries is the favorable temperatures in the spring to early summer for fruit formation. For ever-bearing varieties, we would expect that once the photoperiod is long enough that they would continue to produce fruits all summer long. Not again. 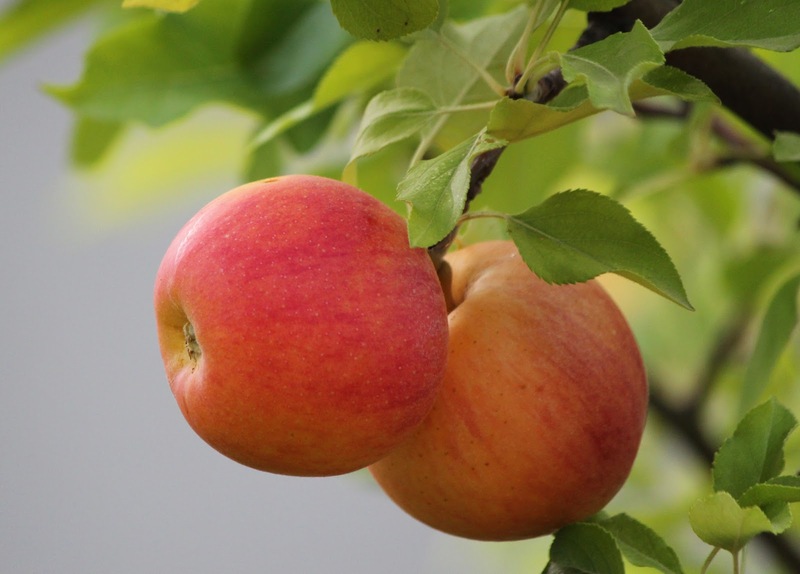 Because they bloom later in the season, high temperatures (Zone 9) limit fruit development. Studies have shown that although flower initiation occurs under high temperatures on ever-bearing varieties, the percentage of fruit formed over the number of flowers is significantly reduced (1). This is the very reason for the characteristic continuous fruiting with relatively low yields on ever-bearing varieties. In spite of their remotancy, only few flowers successfully develop into fruits. 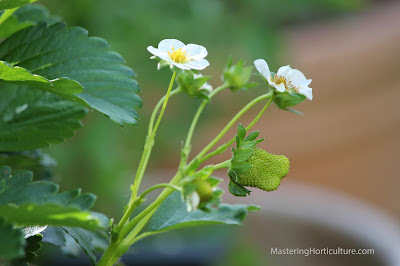 Photoperiod determines flower initiation; temperature determines the development of the strawberry fruit, but the behavior of the plant is determined by genetics. This month is show time for one of my cactus orchid (epiphyllum). Last year I trained the orange one to climb on one of the grapes. The position is good because it is near my kitchen window and when summer comes, the grape leaves will provide shade for this forest-loving plant. As a result - I must say, it's a lot easier to appreciate and take pictures of the flowers when they are at eye-level (Fig.1). Fig. 2 Best pictures are taken on an overcast or rainy day. These plants are very colorful when they bloom. Flowers come in neon colors, it is so difficult to take good pictures under on a clear day because they are like light in themselves. 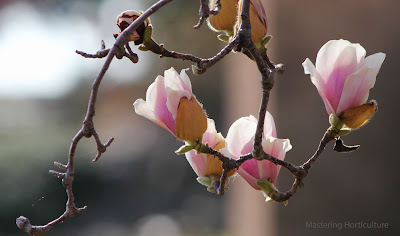 I was lucky this year because when we had several overcast days around their blooming period. 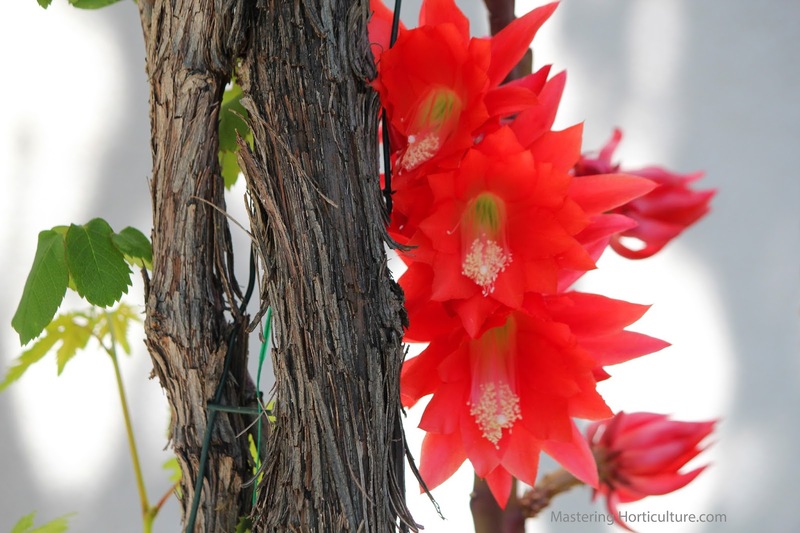 So what do we know about epiphyllum? If you are familiar with Schlumbergera (Christmas Cactus), then you understand a lot of epiphyllum. As an epiphyte it is like an orchid and other aerial plants. 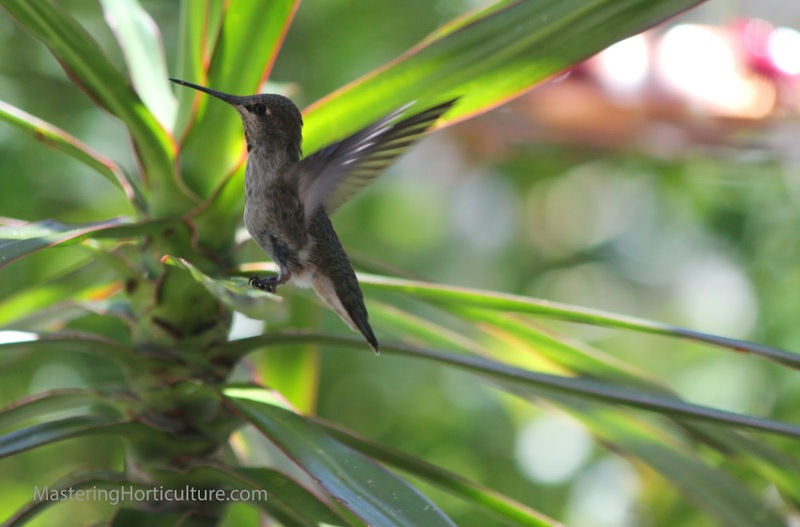 They can grow on other plants such as trees that are strong enough to support their weight. As lithophytes they can also grow on rock crevices where they feed on decomposing leaves and roots - just like other forms of orchids. Epiphyllums are generally of tropical origin and therefore the abundance of rain and atmospheric moisture allow these plants to survive without the roots touching the ground. When they are grown in drier areas like our place, they need to be provided with more water to compensate for the lack of humidity. Fig. 3 Areole: a distinguishing characteristic of a cactus. 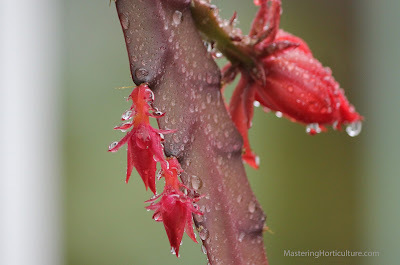 Epiphyllums belong in the cactus family. They exhibit the characteristic spines called areoles (Fig. 3). 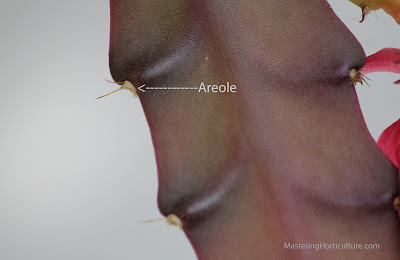 Areole is a specialized branch where a flower originates. 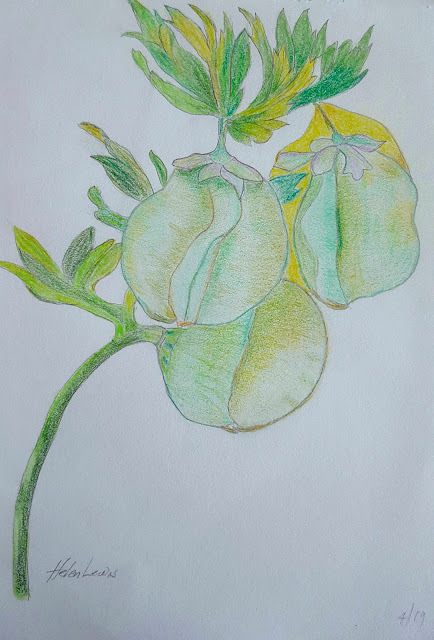 Unlike on some of the more known cacti, the areoles on the epiphyllums are not very conspicuous but when handling the stems you would be notified of their presence in a not-so-pleasant way. 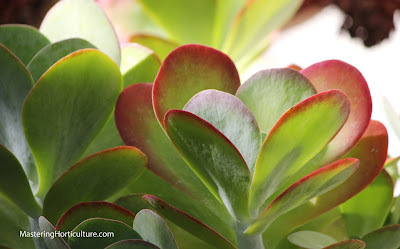 The plants have flat succulent leaves that act as water storage - which is another survival mechanism for aerial plants. In their domesticated life, this feature makes them a good low-maintenance and low-water plant - desirable in a busy world. In my garden, these plants do not get as much care as I would like them to. 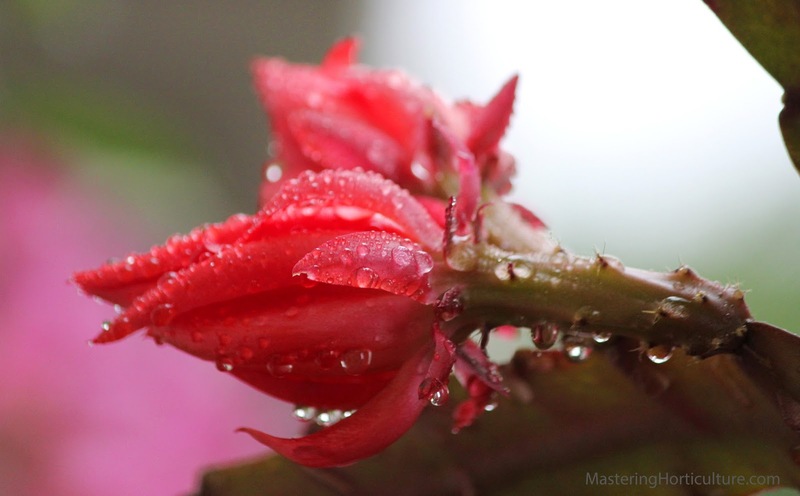 There are times when the plants look shriveled due to prolonged dry condition. The good thing is that they don't die easily. I think it would take a year of no water before they finally die :) They respond positively to a low dose of complete fertilizer. They are also prone to snail damage. To keep the plants looking perfect (if there is such a thing), a regular sprinkling of snail bait is necessary. Fig. 4 The smaller buds on the left were aborted. I also noticed that not all flower buds have a chance to open - some of them gets aborted (Fig 4). At this point I don't know what causes it. I will do some literature review and find out what factors contribute to the unsuccessful flower formation. you might end up liking it. Have You Really Seen a Fig Flower? Fig. 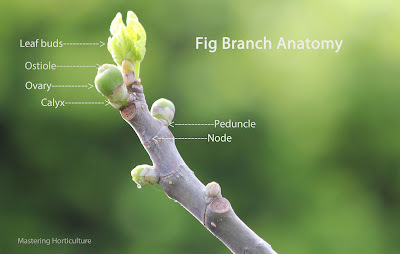 1 Parts of a Fig Branch. One of the trick questions that I like to ask people regarding fig plants is: Have you ever seen a fig flower? The response I get is usually a quizzical look. Of course! Why ask the question? Doesn't everyone know? 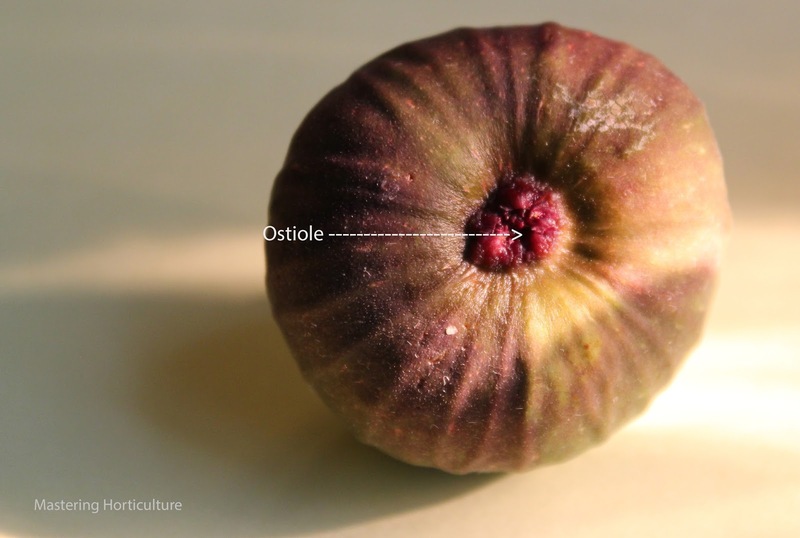 Fig 2 The Ostiole: the entrance for the wasp. Several years ago my fascination about the fig plant and it's fruit led me to write about it and buy my own fig trees. 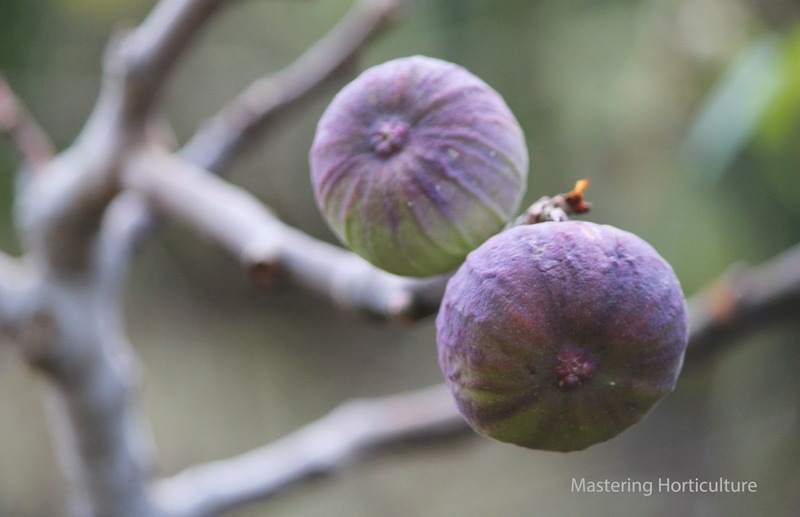 Because of the uniqueness of the fig, even after so many years, I still am intrigued by it. And with my own fig plants being close view from my kitchen, the scrutiny is even more intense. So I thought that figs just bear fruits and we harvest them as they mature. But recently I read some literature that a normal fig plant bears three crops of syconia in a given year. And each crop has a name of its own. 1. Mamme - . These are the fruits remaining on the tree after the leaves have fallen off late in the fall and over winters in the tree and ripen in spring (Fig. 4). 2. Profichi - . These are the fruits that develop in early spring and ripen in early summer (Fig. 5). 3. Mammoni - These are the second wave of edible fruits of the year which ripen in fall. Every plant holds a mystery that awaits discovery. It’s been raining a lot this week! With the temperature warming up at the same time, plants are rushing to come back from their winter break. Leaves are rapidly growing - changing the gray landscape to vibrant green once again. Life is back! For the angiosperms – also known as flowering plants - it’s show time! But while we watch the rebirth in plants, it is also time consider the work that needs to be done at this time in the garden in order to prolong the show that just begun. Here’s my to-do-list of activities this month. It’s kind of short because I will be on vacation for a few days – this is realistic and doable. Replenish soil nutrients. An application of balanced fertilizer such as 15-15-15, 16-16-16, 10-10-10, or even the organic version 5-5-5 to perennial plants, shrubs and trees, groundcover and lawn is a good thing to do at this time. Increase soil organic matter content. A distinguishing characteristic of a poor soil is low in organic matter. Invest in good compost (including decomposed animal manure) to apply throughout the cultivated areas of your garden every year. You can either purchase or make your own compost. If you have not done composting before, this is a good time to try it. Pull out weeds. Pull them out when you see them. There is no better time to control weeds other than before they use up some resources meant for your plant and before they produce seeds. Check irrigation system. Make sure the system is working before we need to turn them on again. In this area, where we do not have the luxury of regular rainfall, irrigation system is the lifeline of the garden during late spring all the way to fall. In addition to that, we want to continue to consciously conserve and use water efficiently. Drought might be over for a while but we need to get into the habit of conserving our natural resources. Plant annuals. In my case I’m planting some vegetables such as radishes (‘French Breakfast’ and ‘Cherry Belle’), chard, and Mexican Sunflower (Tithonia Torch). I intend to plant other warm-season veggies but not yet. However, if you want to harvest tomatoes early, you can plant them now – make sure to protect them from late frost. The problem with planting too early is that they sit there in the garden without showing any significant growth for a long time and that only prolongs their exposure to pests while they’re vulnerable. Clean and Fertilize Plants in Containers. Remove all dead stems and leaves. Prune if necessary. Apply a side-dressing of fresh potting soil with a little bit of complete fertilizer to boost initial growth. Apply another dose of complete fertilizer again after the first month of growth. 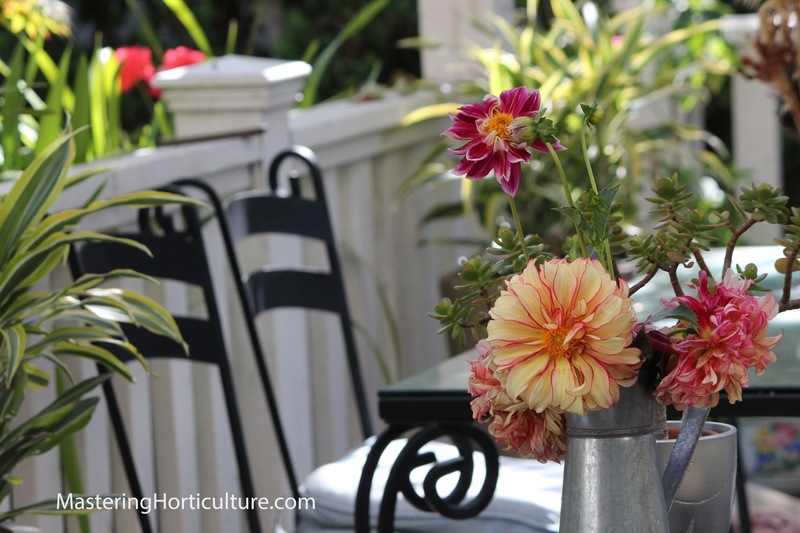 Stroll in your garden...it's good for you.